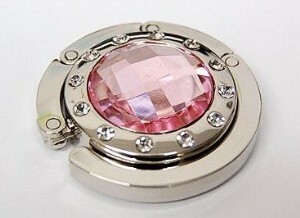 "Crystal" Purse Hooks/Hangers from $2.11 w/ Free Shipping! Wow! Right now at Amazon, you can get these pretty purse hangers for as low as $2.11...and they all ship for free! All of these have really great reviews and seem well worth the low cost! These would make nice, inexpensive holiday gifts. NOTE: Amazon prices change frequently, so some hooks may be higher (or lower) than what is listed below. Click here to see many more colors and styles!